American Film Series, Renovation, Mom & Baby Play Date, Refugee Bears and More! 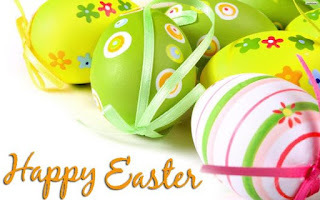 Easter Break: We will be CLOSED from Thursday, April 18th - Sunday, April 28th. Lessons WILL be held regularly on Monday, April 29th and Tuesday, April 30th. All American Corner events are FREE and OPEN to the PUBLIC. 18/04/2019: Don’t Worry, He Won’t Get Far on Foot. Dir. Gus Van Sant. 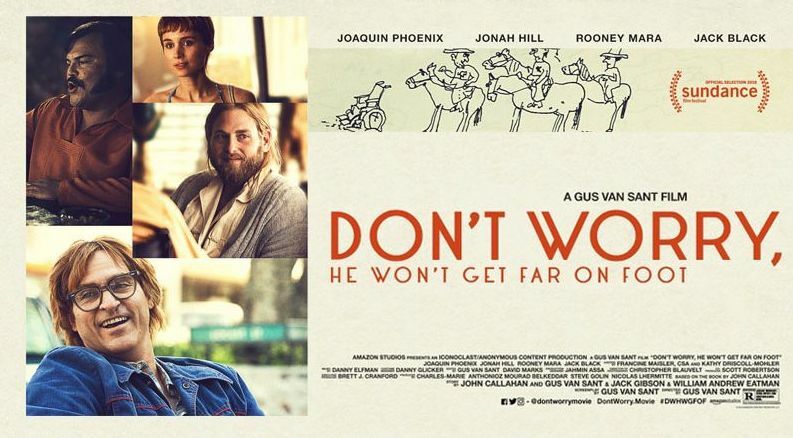 Starring Joaquin Phoenix, Jonah Hill. Biography, comedy, drama. 114 minutes. WHAT ARE WE DOING DURING THE BREAK? We will be CLOSED from Thursday, April 18th - Sunday, April 28th. Lessons WILL be held regularly on Monday, April 29th and Tuesday, April 30th. Wednesday, May 1st is a holiday. Looking for an English Class for the Summer? GLOW Girl's Basketball with the Pros, Renovation, Mom & Baby Play Date, Refugee Bears and More! This is the last week that you can join a Spring Class (now in week 3). The Summer STEAM Program for Kids and Adults is ready. You can register ONLINE. 4:30 pm - Teen Maker Space - making, breaking, creating for Middle and High School students. 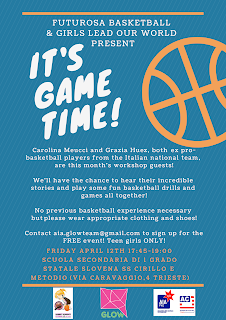 5:45 - 7:00- Girl's Basketball Workshop with the Pros! GLOW - Girls Leading Our World. FREE. For Middle School and High School Girls. Registration Required. The room is almost empty except for boxes and boxes of books! 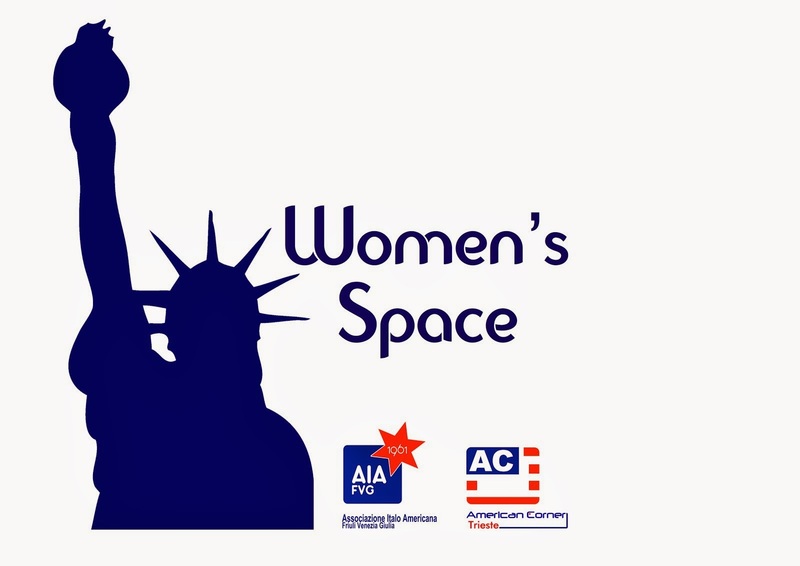 (Our non-fiction and Women's Space Collection). The room looks huge! Countdown to Day 1 of the renovation on April 18th. 🏀⛹️‍♀️ Play Basketball like a Girl! It's Game Time! 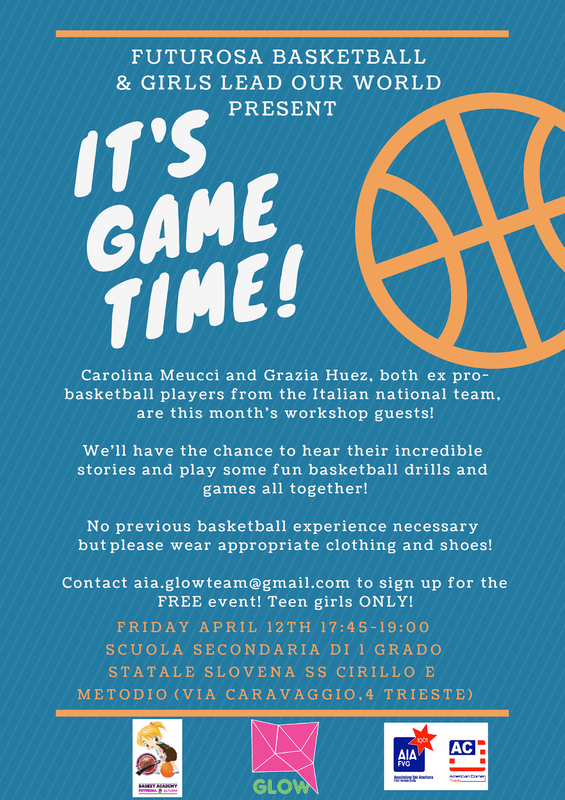 Associazione Italo Americana FVG / American Corner Trieste and ASD Futurosa #Forna Basket Trieste are proud to announce that Carolina Meucci and Grazia Huez, both ex pro-basketball players on the Italian national team, will be our guests and running our final monthly *GLOW workshop! Come meet these incredible athletes, hear their stories and enjoy some basketball drills and games all together. No previous experience playing basketball necessary but please wear appropriate clothing and shoes! The school can be found at the end of the line of bus 9 behind the church. We will MEET DIRECTLY AT THE GYM and NOT at the American Corner. The final GLOW Event of the 2018/19 year is the GLOW Weekend - May 25-26. Details coming soon! * GLOW stands for Girls Leading Our World, an initiative sponsored by American Corners across the globe. GLOW promotes self-advocacy, friendship, leadership, life skills and community through meaningful lessons/activities for adolescent girls in a fun, safe and respectful environment. Most appointments are in English. 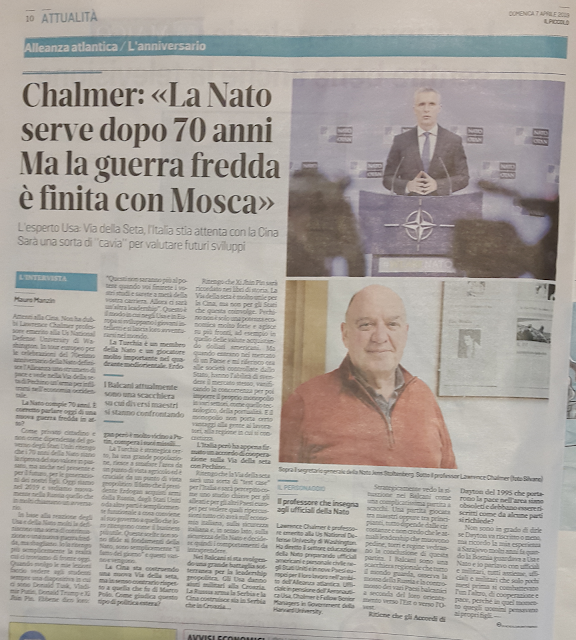 In Trieste, we are now in our 4th year of activity! NATO Celebrates its 70th Anniversary. 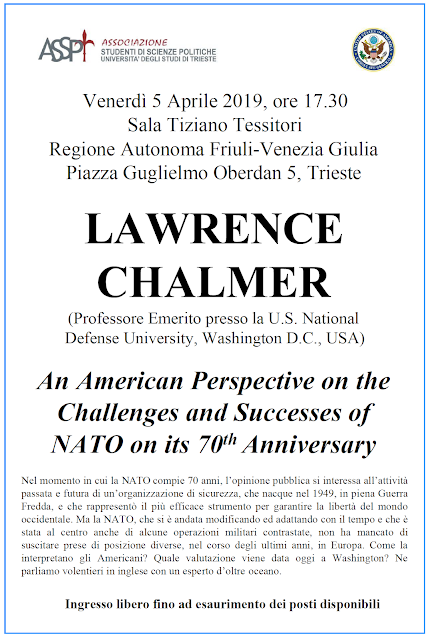 Come to the Conference with Guest Speaker Professor Lawrence Chalmer, NATO expert. Spring Classes, Renovation, Mom & Baby Play Date, Refugee Bears and More! 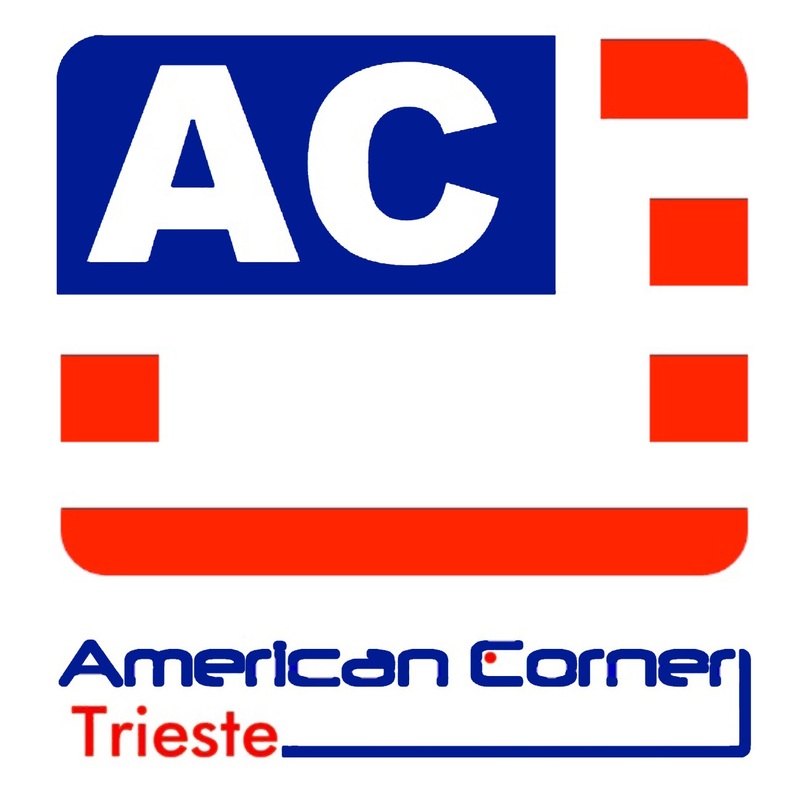 Here's what's up at Associazione Italo Americana FVG / American Corner Trieste. 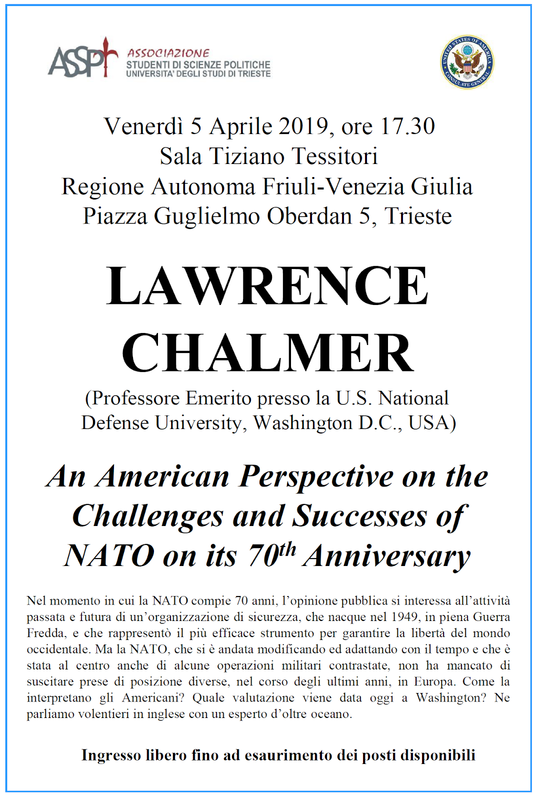 All American Corner events are FREE and OPEN to the PUBLIC. 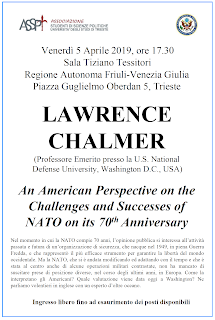 5:30 pm - NATO Challenges and Successes Guest Speaker: Prof. Lawrence Chalmer. at the Regione Friuli Venezia Giulia - Piazza Oberdan 5Sala Tessitori - Free and Open to the Public based on seating availability. We have packed all the books. They will come back on new bookshelves. Pardon our boxes! Curtains have been taken down and decorations removed. 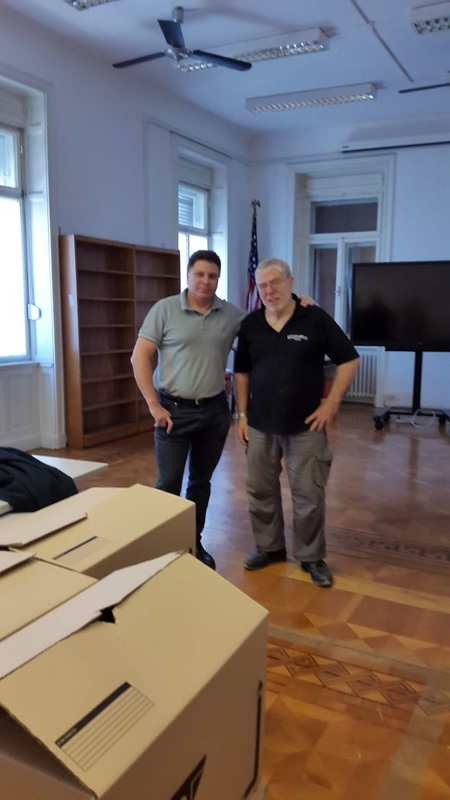 Many thanks to Luciano and Joe for volunteering their time and skill in detaching the bookshelves from the walls in record time! NATO was founded in 1949 with 12 founding member nations (USA, Canada and 10 European Nations). Today there are 29 member nations. Every day, member countries consult and take decisions on security issues at all levels and in a variety of fields. A “NATO decision” is the expression of the collective will of all 29 member countries since all decisions are taken by consensus. Hundreds of officials, as well as civilian and military experts, come to NATO Headquarters each day to exchange information, share ideas and help prepare decisions when needed, in cooperation with national delegations and the staff at NATO Headquarters. 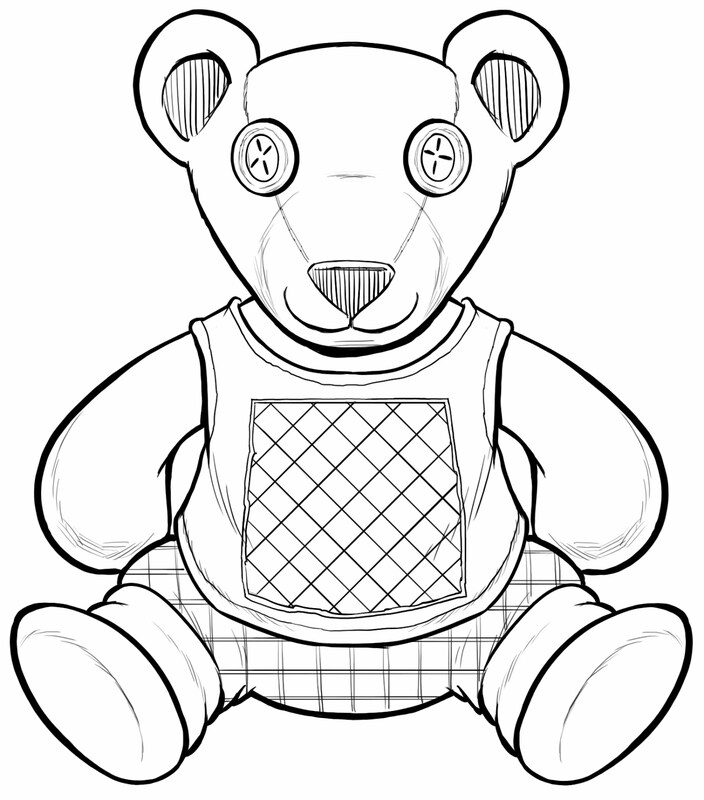 See where the Bears go once they leave the Teddy Team Workshop! English conversation for teachers, Professional Development for Teachers.